Photo: Courtesy of Estée Lauder. Over the past three years, we've seen a lot of clever ways to reinvent what's now a staple product for any major cosmetics brand: Yes, we're talking about the ubiquitous BB cream. Dior and Guerlain created a line of "golden" BBs for a summer glow, MAC put them in compact form for portable coverage, AmorePacific innovated the "cushion" format, and Stila created a CC (color-correcting) cream that changes shades as you apply it. All of these new inventions prompted initial excitement, and then, inevitable backlash: What's actually worth it, and what's just a marketing gimmick? It's probably fair (if, maybe, a little premature) to say that we've entered a new phase of this viral market phenomenon. We'll call it, "Please, not another BB." 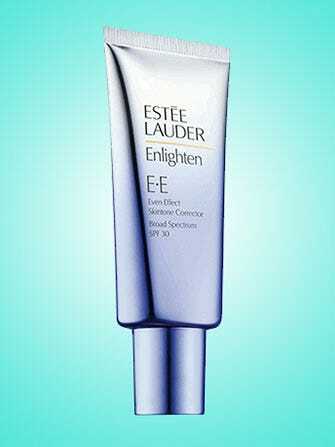 So, when Estée Lauder delivered an EE cream (for "even effect"), our inner skeptics came out in full force. Here's the lowdown: The product is part of a new line the brand is launching called Enlighten, which is targeted to address discoloration. In case you've missed it, there's been a ton of research lately about how the environment affects our skin. (In a nutshell, the worse pollution gets, the worse we'll look when we're older.) Oxidative stress and free-radical damage caused by pollutants have been linked to an increase in dark spots and hyperpigmentation — which are rapidly becoming the token skin concerns of our generation. The EE is designed to be just one element of protecting the complexion, while the other products, a night cream and a moisturizer, focus more on treatment. (Kudos to Estée Lauder for not pretending like this is miracle makeup that will cure everything.) "It's been developed to create an immediately even effect and a more uniform tone," says Nadine Pernodet, MD, the vice president of research at Estée Lauder. (This is different from the flash-in-the-pan "Extra Exfoliating" cream from earlier this year.) "It's a woman's first line of defense against daytime damage — for example, when you're walking to and from work." The color correction happens thanks to a blend of pigments and optics that cheat a natural-looking radiance. This isn't exactly a new concept in the world of makeup, but it's a lot more compelling because it's easy to blend and comes with SPF 30. When you apply the EE with your fingers, it has an instant brightening effect — almost like Touche-Éclat -meets-BB-cream. You could add more to the tops of your cheekbones, the bridge of your nose, under your eyes, the center of your forehead, and your chin for luminosity, without looking dewy or heavy. Is this newbie reinventing the category? No, but that's not the point: "Estée Lauder's BB creams offer sheer, buildable coverage," says Dr. Pernodet. "This is designed to create an instant uniform tone." We like to think of it as an SPF concealer — in bottle format. Get ready for the onslaught of EE creams inevitably coming our way after this launch.